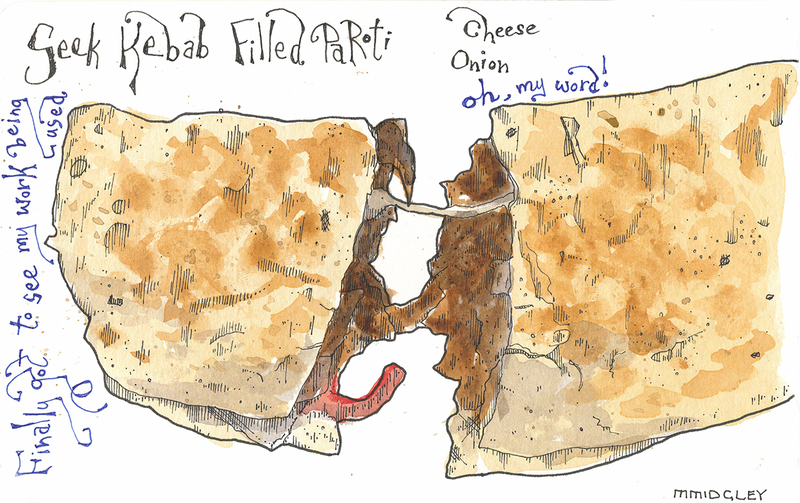 A couple of days ago I was able to dash over to Bradford to find the Flatbread Takeaway shop that had commissioned me to produced illustrations for their menu. I have to say, I wasn’t disappointed! I know, as an illustrator, that it really shouldn’t matter to me about how the finished illustration is used, or rather the context that it is used. 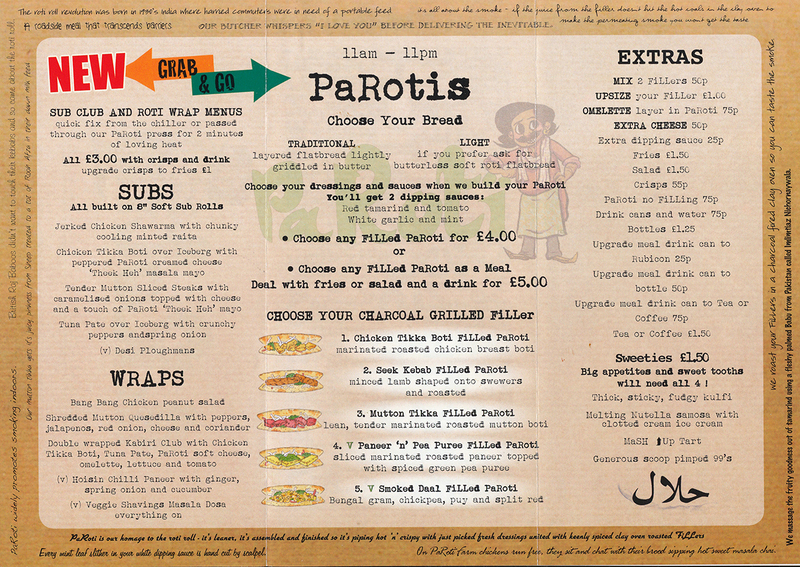 But the owner over at Pa Roti really deserves a tip of the hat for the radical twist he’s giving the roti kebab. First of all; it was fab being able to walk into a shop and see my illustrations on display. Here they were displayed on the menu at the front of the shop – as part of the main Flatbread combos that they serve. So, there they are down the centre of the menu board. The brilliant thing was, that it was the owner who was in there serving when I entered. I felt privileged to be served by him. This was his brainchild, he’s poured time, sweat, money and inspiration into this venture. He told me that the location isn’t the best place; that Bradford isn’t quite as cosmopolitan in its outlook as, say Leeds or Manchester. My Par Roti, looked , and tasted , delicious. Succulent and spicy (well, I did ask for extra chilli!) and , dare I say it, bursting with flavours. The Takeaway shop was a little like an Indian take on Subway; but the flavours were spicy and authentic. It surprised me that the venture hadn’t been as successful as Shezad had expected. I ate indoors; and my food was served on a neat tray with Tamarind and Tomato sauce and a White Garlic and Mint sauce. I neglected to photograph the sticker which closed my paper bag shut. Although I did collect a selection which I’ve reproduced here. A set of five kebab illustrations for a local take away menu. After breakfast we took a trip up to the old part of Pafos town. After wandering around a little; and drawing a church and a battered, old bike, I started to feel a bit peckish. The cafes and restaurants near the old market seemed a bit too tourist-y and so I started to head out of town. I walked back to the newer part of town. Just in time to grab a beer and take in the late afternoon view of the harbour. In the evening there was a western theme to the buffet.